The decades-old developmental fantasy of using Bolivia’s rapid altitude change from the Andes to the Amazon to generate electricity is about to be tested in reality. Two proposed dams – Chepete and El Bala – are set to form the centre of the government’s dream to make Bolivia ‘The Energy Heart of South America’. Located on the Rio Bení north of La Paz, the dams would be the largest infrastructure projects in the country’s history, with total costs approaching $6billion to $8billion. The project was declared a national priority in 2007 and construction starts next year with the aim to have Chepete and El Bala in operation by 2025 and 2030, respectively. In 2014, the government commissioned a feasibility study by Geodata, an Italian engineering firm. Both the process and the findings of the study have exposed many of the significant problems underlying the projects. The government tried to stifle publication of the Geodata study while commissioning another by the same company. In the meantime, they have persisted with plans to begin construction in 2019. Bolivian (and international) law guarantees indigenous groups an open, prior consultation, conducted in good faith, when a project is proposed in their territory. But locals described various instances of corrupt and conniving visits by government officials. Çhepete and El Bala would sever the waterway intersecting Madidi National Park and Pilon Lajas Biosphere Reserve, which together constitute one of the most biodiverse and well-preserved stretches of Amazon rainforest. Their construction would inundate 771 km² of rainforest, an expanse five times greater than the La Paz urban area. The dams would have all of the wider effects typical of hydroelectric development (interruption of sediment flows and nutrient cycles, disruption of fish migration, elevated mercury content) in one of the most critical ecosystems on earth. For the people living in this region, this is not an exclusively environmental issue: their interdependence with the natural environment would make the dams a socio-ecological disaster. Most directly, the inundations would displace over 4,000 people from the Mosetén, Leco Tacana, and San Jose de Uchupiamona groups – with no clear plan for their resettlement and no compensation for the disappearance of thousands of years of cultural patrimony. 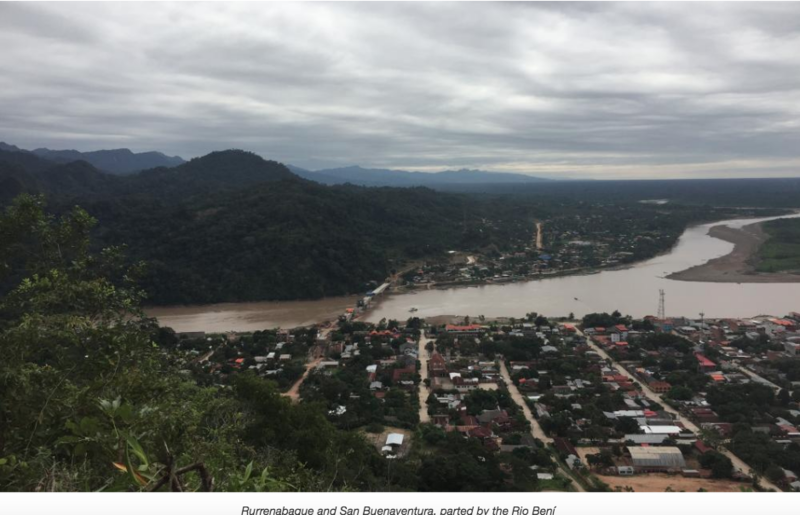 A similar fate will befall those not directly inundated by the reservoirs, as the ecological destruction will deprive both local indigenous nations and the downstream towns of Rurrenabaque and San Buenaventura of their livelihoods. Since the 1990s, the region has depended on a thriving eco-tourism industry. This sector, which respects the local environment and cultural heritage while providing sustainable incomes, would be crippled by the dams’ impacts. The area is geologically unstable, suggesting a possibility of dam failure caused by landslides or intense rainfall. Recent disasters in Colombia and Laos show just how easily this can unfold, especially in light of increasingly severe weather events due to climate change. Perhaps most remarkably, though, the project does not appear to be economically viable. Even the most favorable price estimate (55 USD/mgwhr) exceeds the current market price of energy in Brazil (52 USD/mgwhr), the supposed export market for electricity. Significantly, these estimates consider neither the cost for the transmission line necessary to transport the electricity, nor the likely price decrease induced by Brazil’s domestic development of energy alternatives. President Evo Morales presents himself as an anti-capitalist advocate for indigenous rights and environmental protection. Some people in the region have said that Evo’s administration began with honest intentions to support a radical leftist transition, while others have suggested that the rhetoric was only a ruse to gain office. All agreed that a systematic disregard for these values has been borne out of a desire to build, maintain, and consolidate executive power. After nationalizing hydrocarbon resources early in his Presidency, Morales used this income to develop and expand social programs aimed at reducing poverty and improving the standard of living. But as Morales’ popularity began to rely on these social investments, his dependence on the extractive industries that fund them has also deepened. Fracking in Tarija, lithium mining in Salar de Uyuni, and, most of all, the TIPNIS highway are all designed to appease Morales’ supporters and augment government bank accounts. And they have all created a wide spectrum of ecological conflicts and resistances. With hydrocarbon reserves being depleted more rapidly than expected, Morales is turning to hydropower dams like Chepete and El Bala to maintain the income needed for social investments. But rather than being the key to a sustainable and just future, Chepete and El Bala appear only to be the next step in a line of contradictory, exploitative, and authoritarian projects which disregard the interests and people Morales purports to represent in favor of those on which his power depends. Fortunately, there is a vast network of selfless and determined people fighting against this potentially great social and environmental injustice. Their resistance is now the most crucial part of the story. La mancomunidad de las comunidades (commonwealth of communities) was founded to represent the indigenous groups who will be most affected by the dams. They have been the focal point for resistance and communications while representing interests abroad to raise awareness and build capacity. La Coordinadora para la Defensa de la Amazonia (Coordinator for the Defense of the Amazon), was formed by a conjunction of indigenous peoples living in the protected areas and local citizens in Rurrenabaque and San Buenaventura. They play a key role in providing supplies, finances, and organizational support. In the urban centers of La Paz, Cochabamba, and Santa Cruz, larger networks of activists spread the message of the planned injustice amongst a wider and more detached populace. Most significant among these are Fundación Solón and CEDIB. They have played a central role in disseminating information via several media to raise awareness about the injustices and incongruities inherent to current plans for Chepete and El Bala and speaking truth to power more directly in La Paz. There’s a large sign standing outside the two-story, house-like airport building in Rurrenabaque. The right third is a picture of Morales in full presidential regalia, with the rest of the board announcing the details of an airport renovation project taking place this year. Under the facts, figures, and timeframe it says, “Con grandes obras cambiamos la historia”: with great works we change history. The activists, scholars, and leaders whom I had the humbling privilege of interviewing are some of the most dedicated, selfless, and inspiring people I have ever had the honor to know. I was thinking of them as I left Rurrenabaque and once more saw Evo smiling on the sign. Con grandes obras cambiamos la historia. But with them in mind, I would suggest a different line: Con grandes resistencias cambiamos el futuro. With great resistances we change the future. Jonathan Elwell is a political science student at Carleton College in the United States with experience researching and writing on issues related to climate change and development.